Our Beaver Game Table is simple to make yet offers a great deal of personality. The friendly beaver has chewed a chunk of wood from the tabletop! When people see these projects they love them! You can make just the table or you can make the complete three piece table and stools set. Table is 27"H. Stools are 18"H. Plans drawn FULL SIZE. Order plans and hardware separately or see Special below. Beaver Game Table Hardware includes twelve natural wood checkers, twelve walnut colored checkers, 2 brown plastic eyes and a screw hole button for the belly button. Project plan, wood, and wood finish are not included. 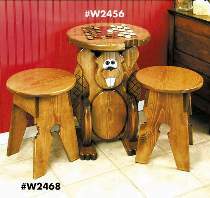 Beaver Game Table Plan, Stool Plan and hardware parts package sold separately or see #6335 Special Offer which includes both plans and the hardware.